It's off to the races with Alcazar Maduro! That's right, this tasty maduro is named after the famed race horse of the same name, originally released in 1998, as smokers began to develop a taste for Nicaraguan tobacco. 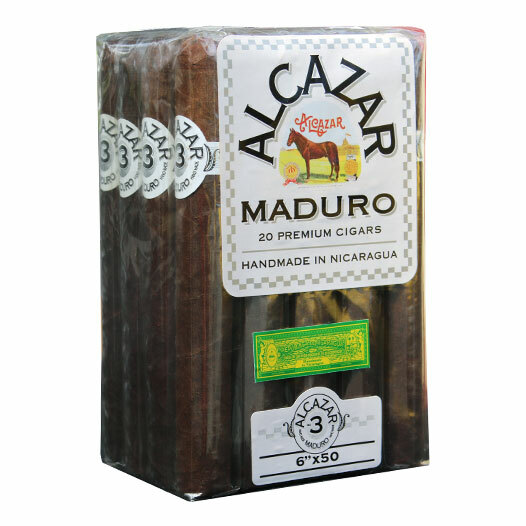 Alcazar Maduro is a bundle-style cigar that's priced to sell as quick as its namesake, using a bevy of long-leaf Nicaraguan fillers and binder, and complimented with a dark and oily Connecticut Broadleaf wrapper. This gives the cigars (each sized at 50-plus in ring gauge) a medium body and loads of gritty, chewy smoke! Flavors range from baker's cocoa and freshly ground coffee, to earth, black pepper, and even a touch of New Orleans-style chicory coffee. Stock up on this heavy maduro and enjoy one any time of day, whether you're mowing the lawn, going out for a round of golf, or, our personal recommendation, heading to the track.